The large-area coverage of 3G and 4G networks provides people with better communication services, which brings great convenience to people, and at the same time, the problems caused by the expansion of communication networks are also increasing day by day. The increase in the number of communication devices has led to an increase in the difficulty of maintenance. If the communication tower is not maintained in time, the communication devices are easy to get destroyed. If the communication devices cannot be maintained in time when damaged by natural environment or human factors, it will result in tilting, deformation or even collapse of the communication line tower. Once the communication tower collapses, communication in the coverage area will be interrupted. In recent years, the accident of the collapse of the communication tower has been increasing, which has seriously affected people’s daily lives. For the maintenance of communication towers, most of them are manually tested by plumbs and other manual methods to check whether the tower has physical damage to the surface, such as tilting of the tower, rust or deformation of the steel structure, loose screws, loss of nuts, etc. Engineers use these surface physical phenomena to simply judge whether the working state of the tower is normal. This is not only inefficient, but also cannot monitor the communication tower state in time and make early prediction of the tower tilt so as to eliminate potential safety hazards in time. In reality, the lack of monitoring personnel and the backwardness of testing methods often lead to more serious problems. The consequences of the tilting of the tower are very serious, which will greatly reduce the service life of the tower, increase the cost of use, and severely cause local communication interruption. 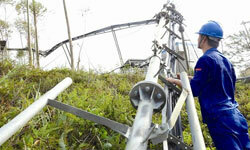 Therefore, the maintenance method of the communication tower urgently needs to be improved. According to the practical situations, Vigor Technology has specially developed TMS Tower Monitoring System which allows engineers to monitor the state of communication towers, transmission towers, television towers and etc. in time at any place via internet. According to the long-term real-time monitoring data, the tower maintenance personnel can purposely monitor and maintain the tower and narrow the scope of detection. Based on the data, engineers can analyze possible problems in advance. Learn more information about TMS Tower Monitoring System. Recently, one of our Russian clients said that Vigor SST162 works perfectly in this communication tower monitoring project. The SST162 is installed on the upper part of the tower body. Through the remote monitoring system, our client can monitor the real-time inclination data of communication tower online. When the inclination data is beyond the safety limits, the inclination data monitored by Vigor SST162 inclinometer will be transferred to the motoring system, and a short message will be sent to the tower maintaining personnel. As the application site of this customer is in high latitude with arctic climate, our engineers specially added a heat treatment design in the SST162 for this Russian customer. After about 5-month usage, the SST162 inclinometer received a high recognition from this customer. 1. Integrated with MEMS accelerometer, featuring high working performance. 2. Built-in nonlinear compensation, horizontal axis error compensation. 3. Integrated with filtering technology, EMC as well as other technologies. 4. Monitoring accuracy up to ±0.1°@ -20～65C°. 5. Impact resistance 100g@11ms triaxial (half sine wave). If you want to learn more information about it, please visit our official website for more details.